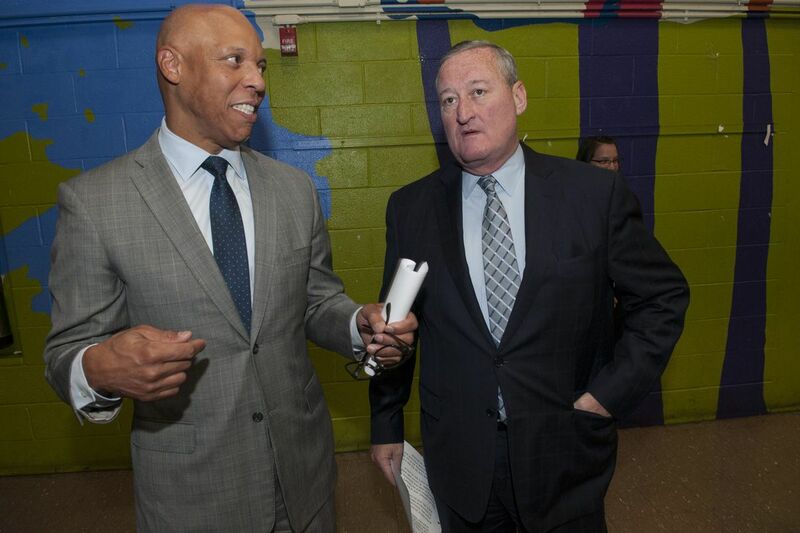 Two key players in the plan to save Philly schools: Superintendent William R. Hite (left) and Mayor Kenney. Since 2001, the School Reform Commission (SRC) has overseen the city's more than 200 district and charter schools, and the more than 200,000 children they serve. Come July 1, the School District of Philadelphia will be governed by a mayoral-appointed Board of Education. We also support the proposed City Charter amendment voters will see on primary election day. The amendment, notably, does not approve the change in governance. This was initiated by a vote of the SRC and confirmed by the Pennsylvania secretary of education in December 2017. Approval of the May 15 ballot question would make sensible adjustments to the eligibility, nomination, appointment, and removal of school board members. Seventy encourages voters to review our full statement on the proposal at www.seventy.org. Most important, for the first time in nearly 17 years, the buck will stop at one desk: the mayor's. For a system as large and complex as the School District, clear accountability is essential. The SRC was, by design, largely insulated from political pressure, and therefore also from the voters. This will soon no longer be the case. Still, responsibility for our schools will not only reside within one office. City Council sets the levies that currently provide nearly half of the School District budget. Philadelphia's state senators and representatives must work with their colleagues in the General Assembly for the education policy and funding needed not only for our children, but others across the commonwealth. Our delegation in Congress has a similar responsibility. Meanwhile, the nine Philadelphians selected to the new school board will be approving budgets, issuing debt, and overseeing the superintendent, who runs the district on a daily basis. For this first cohort of board members in particular, setting the highest possible standard for ethics and integrity is critical. But responsibility still does not end there. Voters choose our elected officials. We must stay informed on the issues, demand action, and expect results. With that in mind, scores of candidates across the city are vying for legislative and congressional seats this year. And municipal offices are on the ballot in 2019. The Committee of Seventy looks forward to working with the new school board, our elected officials, and organizations across the city to ensure all children have the opportunity to reach their potential. David Thornburgh is CEO of the Committee of Seventy, a nonpartisan advocate for better government and politics in Philadelphia and Pennsylvania.